Shetterly, Will, and Vince Stone. Captain Confederacy (vol. 1) #1. Steeldragon 1986. What if: The South won the Civil War due to un-described events c. 1862. Series note: Two comic book series published by Steeldragon Press and Epic Comics. Shetterly, Will, and Vince Stone. Captain Confederacy #1: The Nature of the Hero . Lulu.com 2007. Shetterly, Will, and Vince Stone. Captain Confederacy (vol. 1). Summary: The CSA develops a Captain America-type superhero in the 1980s but he is unhappy being ordered about in an apartheid-ridden country. Comments: Several issues also included as a backup story Stu Shiffman's "Saks and Violet", q.v. Published: Twelve-issue comic book series, Steeldragon 1986-87. Published: Issues #1-2 revised and re-issued as Captain Confederacy Special Edition . Published: All twelve issues revised and posted to Shetterly's 'Captain Confederacy" blog January-November 2006. Published: Series revised and re-published in graphic novel form as Captain Confederacy #1: The Nature of the Hero , Lulu.com 2007; createspace 2012 (1475297793BUY). Shetterly, Will, and Vince Stone. Captain Confederacy (vol. 2) #1. Epic Comics 1991. Shetterly, Will, and Vince Stone. Captain Confederacy (vol. 2). Summary: Super-heroes from eight North American nations, Germany and Japan meet in New Orleans, where the representative from Texas is murdered for his weaponry. Comments: 2012 reprint includes backup story "Yankee UFO". Published: Four-issue comic book series, Epic Comics 1991-92. Published: Series revised and re-published in graphic novel form as Captain Confederacy 2: Hero Worship , createspace 2012 (1477454322BUY). Shetterly, Will. 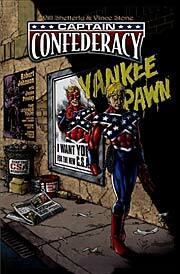 "The Captain's Story"
Comments: How Captain Confederacy comics came to be. Published: In Captain Confederacy (vol. 2) #1 (December 1991, Epic Comics). Shetterly, Will. "Hero Worship: Public Faces and Private Dreams"
Summary: An autobiographical sketch of a reporter, born to Union parents but working in the CSA. Published: In Captain Confederacy (vol. 2) #2 (January 1992, Epic Comics). Shiffman, Stu. "Saks & Violet"
Summary: Humorous backup tale to Shetterly and Stone's Captain Confederacy, q.v., storyline proper, set in an independent New York City in the late 1800s.